I grew up in Los Angeles and after traveling for some time, I developed a theory: the farther away from LA I was, the harder it was to find good Mexican food. When I moved to NYC seven years ago, I was cautiously hopeful about finding decent Mexican food. After some trials and errors, I’ve thrown together a shortlist of some of the best Mexican restaurants I’ve found so far. It has LA in the name. It has to be good, right? The first time I went toLupe’s East LA Kitchen I had the chile relleno with rice and beans. I almost cried. It reminded me of home. The second time I went, I had the super burrito. I couldn’t finish it. The servings are generous. I was salty about paying $10 for a burrito but I chalked it up to the NYC rent surcharge. On a tiny corner in Soho, La Esquina churns out some amazing dishes. My favorite is the Plato Julia — rice, corn, black beans, pico de gallo, queso fresco, avocado. All the ingredients tasted fresh, balanced, and cared for. There are plenty of hot sauces readily available. The seating area upstairs is tiny and usually packed for good reason. But there is a brasserie downstairs with its own menu. Plan ahead if you’re heading downstairs. Their website advises making a reservation 3 weeks in advance (!). This gem of a truck in Sunset Park is parked next to Melody Lanes bowling alley and stays open late. 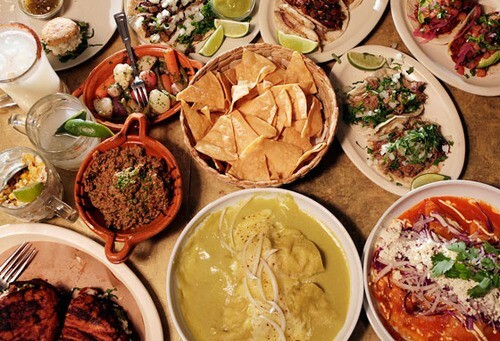 If you find yourself lucky enough to be in the area, stop by Tacos El Bronco and order as many tacos as you can eat. The Pastor and Bistec are juicy, drippy, and topped with fresh greens and a radish. The prices are low, the quality is amazing and you can visit Pete in the bowling alley bar afterward for the Pete’s Special. Pro-tip: a good bowl of guac costs $14 in this city. Don’t waste it on bad pre-made guac. Rosa Mexicano is a national chain so if you’re fiending for guac in an unfamiliar city, see if there’s a Rosa nearby. And the sangria is amazing. Bonus: If you’re in LA or traveling there soon, go here. Just go. Go now, actually. ‪#WashingtonDC: @ringlingbros is in town and performing right across the street from ‪#RosaMexicano! To celebrate, stop by our ‪#DC restaurant from 4-7pm TODAY wearing a RED NOSE and receive a free‪ #margarita or ‪#guacamole! 37rd St. & 5th Ave.